The largest publicly traded partnership by market capitalization, Enterprise Products Partners LP (NYSE: EPD) has amassed an unparalleled asset base in terms of its interconnections, geographic diversity and exposure to a wide range of hydrocarbons. 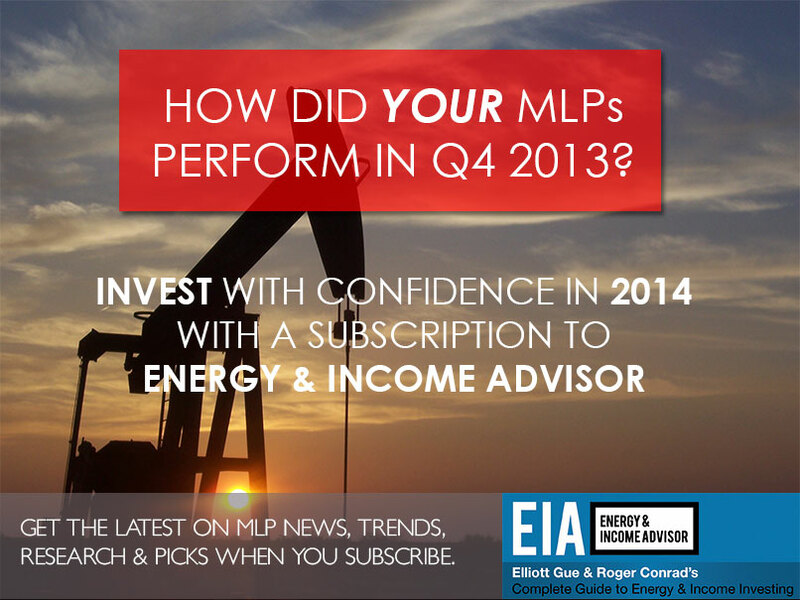 Equally important, the master limited partnership (MLP) boasts a forward-thinking management team that always seems to be ahead of the crowd in identifying and taking advantage of emerging growth opportunities in the rapidly shifting North American energy landscape. Case in Point: Enterprise Products Partners was the first midstream operator to develop significant capacity to export propane, providing customers with a demand outlet for the growing oversupply and giving the MLP a built-in hedge against weak North American prices. This unique combination of a well-integrated asset base and prescient management team makes the stock a foundational holding for investors and has enabled the partnership to increase its distribution in 38 consecutive quarters. And the management team’s candor and insight make Enterprise Products Partners’ quarterly earnings calls and conference presentations must-attend events for investors looking to spot profitable trends in the energy patch. The blue-chip MLP’s recent analyst meeting (slides, webcast) lived up to this high standard, with management sharing its updated forecast for North American energy markets and highlighting several emerging opportunities. 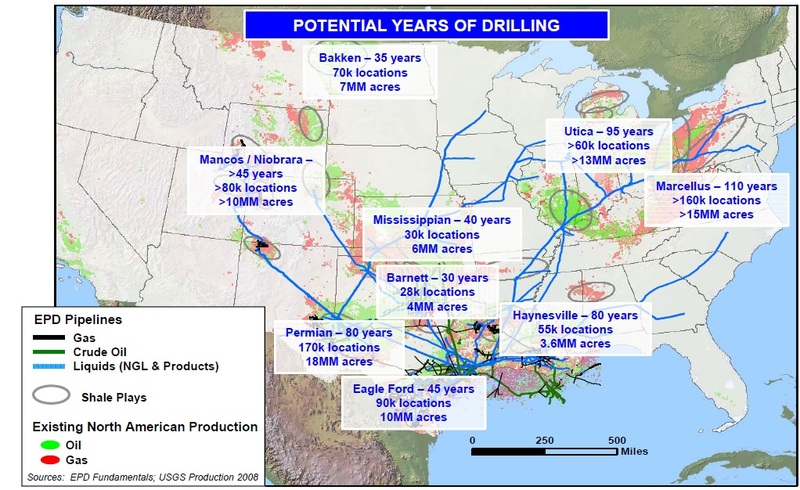 Anthony Chovanec, Enterprise Products Partners’ vice president of fundamentals and strategic assessment, started his presentation with a familiar slide that emphasizes the decades of drilling ahead in the major US shale oil and gas plays. Although this massive resource base creates an impressive opportunity set for almost every link in the energy value chain, the shale oil and gas revolution hasn’t been without its fair share of growing pains and volatility. Midstream (pipelines) and downstream (refining and marketing) operators continue to play catch up with the upsurge in US hydrocarbon production, creating short-term price dislocations and increasing the risk of volatility during temporary capacity outages. The nation’s newfound energy abundance has also overwhelmed North American demand for natural gas and some natural gas liquids, depressing prices for these commodities and creating export opportunities. Here’s Enterprise Products Partners’ updated assessment of this ever-shifting landscape. Enterprise Products Partners’ base case calls for US natural-gas production to reach 90 billion cubic feet per day (bcf/d) by 2020, an increase of 25 percent from the 72 bcf/d extracted last year. This forecast represents an upward revision from the MLP’s prior projections, which had targeted annual natural-gas output of 84.1 billion cubic feet per day by 2020. At the Analyst Day meeting, Chovanec suggested that investors expecting a sustainable recovery in North American natural-gas prices likely would be disappointed. I have to tell you, I think that the forward curve is right on target with these numbers here today. So what you see is rather than gas prices going up, the producers are working to be able to get their cost down. And so it’s a break-even analysis that we do, as long as you have good benefits from processing the margins and from associated crude oil, you’re going to produce natural gas all that you can. So it’s hard, I don’t know exactly where that number runs, but it’s hard to get too bullish on natural gas prices. But investors shouldn’t confuse the tepid outlook for natural-gas prices with a lack of opportunity for midstream and downstream operators. Surging production from the Marcellus Shale creates a need for additional pipeline capacity to meet customer demand in the Northeast, especially when regional gas consumption jumps to 20 bcf/d in the winter. And when demand tumbles to 9 bcf/d during the summer, producers need pipeline capacity that will move their volumes into the Midwest and to the Gulf Coast. The promise of exporting liquefied natural gas (LNG)–Enterprise Products Partners’ outlook assumes that the US ships between 5 and 6 bcf/d internationally as we get closer to 2020–also creates opportunities for header systems that would feed these terminals. 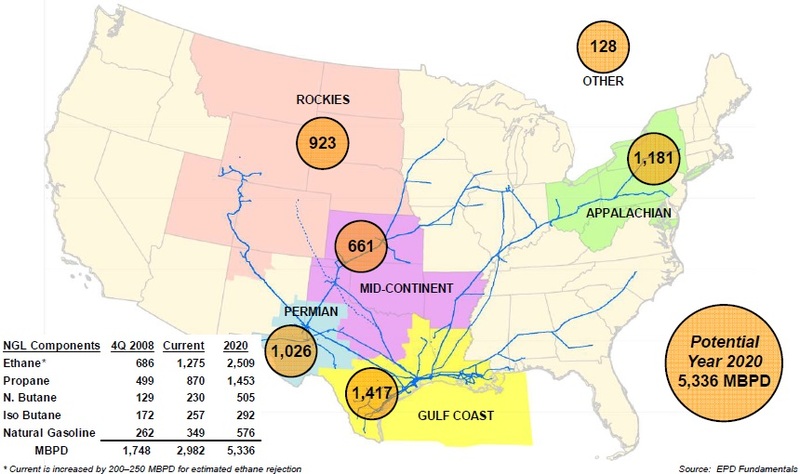 Meanwhile, investors shouldn’t overlook rising pipeline exports to Mexico and growing demand for natural gas among electric utilities in the Southeast. 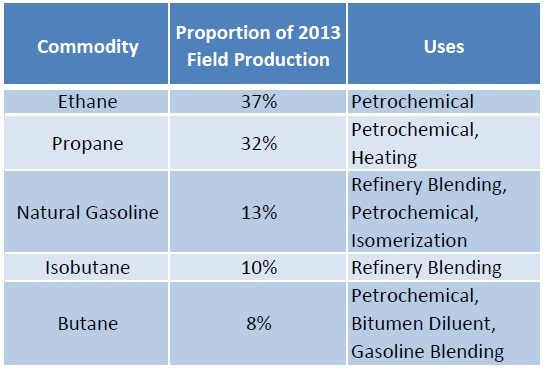 Natural gas liquids (NGL) are heavier hydrocarbons that occur underground with natural gas (methane) and comprise five distinct commodities: ethane, propane, butane, isobutane and natural gasoline. The price of a mixed barrel of these hydrocarbons, some of which can replace naphtha and other oil derivatives in industrial and petrochemical processes, traditionally has tracked movements in the price of crude oil. However, this relationship has broken down in recent years because of weakness in ethane and propane prices, the two most prominent NGLs by volume. Enterprise Products Partners expects US NGL production to surge by 79 percent through 2020, thanks to superior price realizations relative to fields that produce primarily natural gas and rising exports of propane and butane. Higher propane prices and the construction of world-scale petrochemical facilities on the Gulf Coast should increase demand for ethane by 600,000 to 750,000 barrels per day. Meanwhile, favorable cash costs relative to naphtha have stirred up interest in ethane exports–a niche opportunity that Enterprise Products Partners estimates at 100,000 barrels per day. 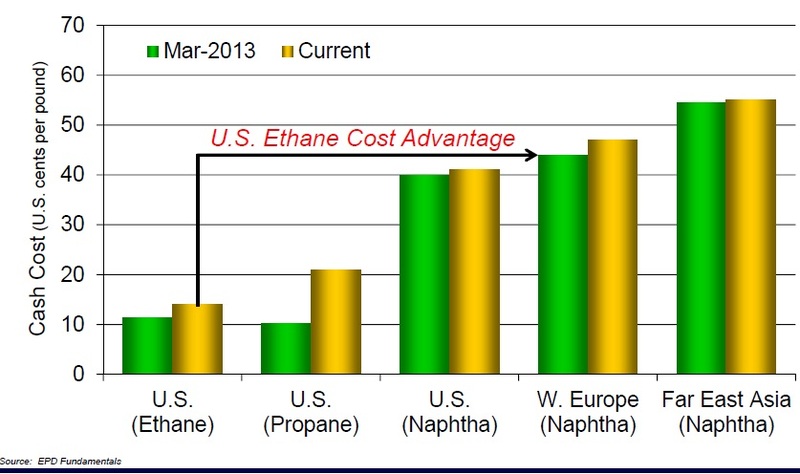 Although the price spreads between ethane and naphtha (a derivative of crude oil) makes a compelling case for seaborne exports to European petrochemical companies, capital-intensive facility upgrades and a lack of specialized carriers present impediments to a near-term upsurge in shipments of this NGL. Given the growth on the supply side, management expects the price of this commodity to remain depressed in North America, leading to ongoing ethane rejection in the Midcontinent region and other plays that are further from the fractionation complex on the Gulf Coast. 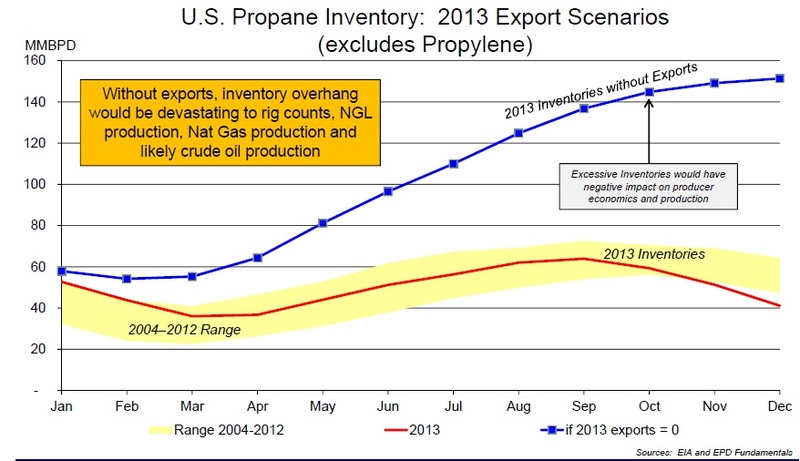 In contrast, favorable price spreads and growing export capacity should continue to encourage growing US exports of propane and butane, helping to balance these markets and provide some price support. To this end, Enterprise Products Partners’ rapid expansion of its dock capacity on the Gulf Coast last year enabled the US to overtake Qatar as the world’s leading propane exporter and helped to prevent the domestic market from slipping into an oversupply. 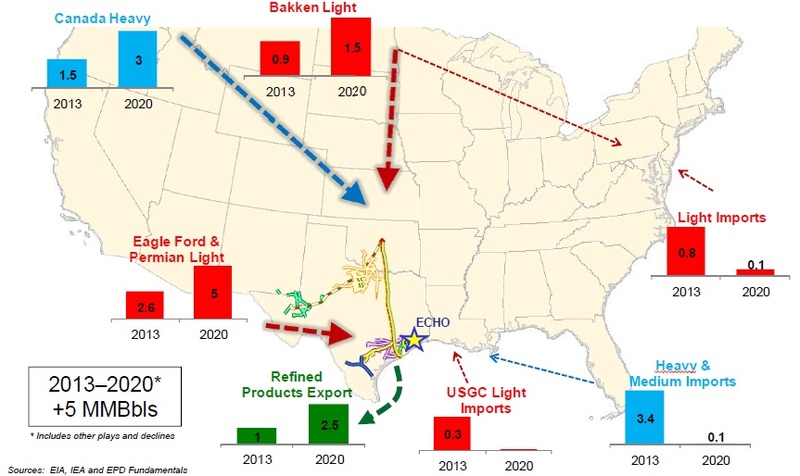 Enterprise Products Partners’ internal forecast calls for North American oil production to increase by more than 5 million barrels per day through 2020, with domestic supplies of light-sweet crude oil from the Bakken Shale, Eagle Ford Shale and Permian Basin largely displacing imports to the Gulf Coast and the East Coast. With imports of light-sweet crude oil already at negligible levels on the Gulf Coast, this outlook isn’t particularly controversial and appears to be more of a fait accompli. However, the MLP’s projections also call for rising production of medium crude oil and the increasing availability of bitumen extracted from Canada’s tar sands to reduce Gulf Coast imports of these grades to 100,000 barrels from 3.4 million barrels. Personally, I think there is going to be too much of it [light-sweet crude oil], that’s going to have to go some place. So I think it’s going to reach saturation. I have a growing concern into the front end units of these refineries and handling light-ins is limited without expansions or having a few expansions that have been announced. But at the same time when we bring the heavy crudes from Canada, you’ve got to remember what the diluents in there. That’s probably a 30 percent to 40 percent light end stream that has the end and the refinery as well. So I think we do at some point in time, if we hadn’t seen it already with the condensates, start to see some depressed pricing on the Gulf Coast with the light sweet stuff. This outlook gibes with our concern that West Texas Intermediate (WTI) and Light Louisiana Sweet (LLS) crude oil could be poised for another fall, especially during periods of heavy refinery turnarounds. Late last year, we pared our exposure to most US upstream operators, though we would look for a downdraft in WTI and LLS as an opportunity to establish or build positions in EOG Resources (NYSE: EOG) and other higher-quality names. Based on Enterprise Products Partners’ existing asset base and outlook for North American energy markets, management highlighted a number of key growth opportunities that the MLP will pursue over the next few years. Although an investor can profit from these opportunities via a position in Enterprise Products Partners, other names offer concentrated exposure to these trends and more upside potential. Enterprise Products Partners’ management team confirmed that the growing surplus of natural gas, NGLs and light-sweet crude oil continues to create investment opportunities on the demand side. The MLP already emerged as the early leader in US propane exports, loading about 77 percent of US shipments from its facilities on the Gulf Coast. Next year, the partnership will complete projects that will more than double its current export capacity to about 16 million barrels of propane and/or butane per month. Management also highlighted a number of opportunities to handle the surging supply of crude oil headed to the Gulf Coast and growing exports of gasoline, diesel and other refined products to international markets. Investors looking to profit from these trends should consider a stake in Oiltanking Partners LP (NYSE: OILT), an MLP owns significant dock space on the Gulf Coast and has reaped the rewards of working with Enterprise Products Partners to build the nation’s largest export terminal for propane and butane. 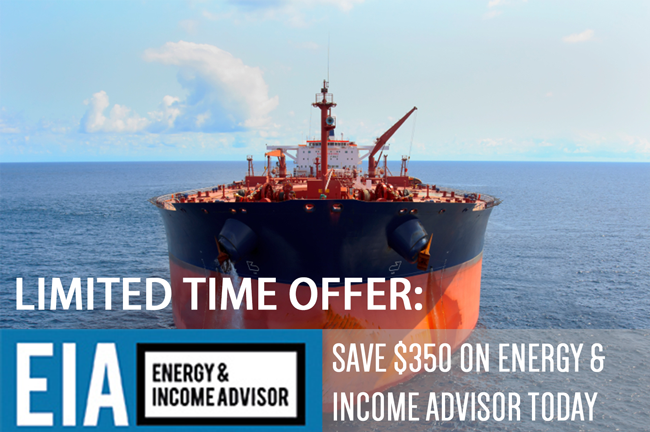 Oiltanking Partners earns volume-based throughput fees on these shipments and a share in the margin received on every customer vessels loaded at the Houston Terminal. In addition to its partnership with the leading US propane exporter, Oiltanking Partners owns significant storage capacity on the Houston Ship Channel and in Beaumont, Texas, and has ample opportunity to expand these facilities to take advantage of robust customer demand. This MLP’s stock has generated a total return of almost 50 percent since we added the stock to our Conservative Portfolio in September 2013–and we see more upside to come. An anticipated secondary offering to fund a drop-down transaction from Oiltanking Partners’ general partner could give patient investors an opportunity to add exposure to this growth story. The Bakken Shale, the Eagle Ford Shale and the Marcellus Shale may get all the press as producers ramp up output in these plays, but the Permian Basin–an area in west Texas that’s been in production for more than a century–appears poised for a breakout this year. As operators become more comfortable with the area’s complex geology and hone their drilling and completion techniques, activity will shift from a development to a highly efficient, manufacturing-based approach. So the other place I’m very excited about it is the Permian…I think if you look at it to the bottom of the slide, there’s 466 rigs working out there today…that’s about a third of the rigs working in the US. We project from Tony’s supply appraisal group 1 million barrels a day in production growth by 2020. That’s a lot of crude, a lot needs to be done with it. We’ve got a good footprint out there, a fairly large system. And we’re excited about the opportunity. We have a number of projects under development, not ready to announce a lot of them today but they range everything from small well connects into our system all the way up to large trunk lines going out across the producing area. So hopefully we’ll see some of those come to fruition here in the next couple of months. I think we’re getting very close on a few of them…. 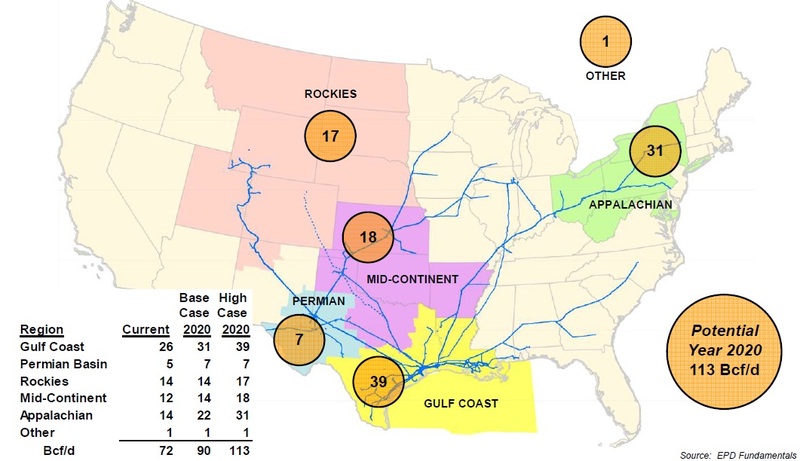 [M]oving ahead, the Permian is going to be one key area of our focus going forward. I think we have something that could be special out there, and it’s our Midland terminal. Storage is going to be extremely valuable with all this additional crude coming on and having to get staged and moved to other markets, and we’re getting a significant interest from the industry. Investors looking for leveraged plays on these trends should consider MLPs with gathering systems that serve some of the biggest producers in the Delaware and Midland basins. Halliburton (NYSE: HAL) and other major oil-field services names with a presence in this basin also stand to benefit from improving efficiency, as upstream operators transition to pad drilling–an approach that enables producers to sink multiple wells from a single site. With all the focus on the rapid production growth occurring in the nation’s major shale oil and gas plays, investors can easily lose sight of the rebound in activity in the Gulf of Mexico. Enterprise Products Partners expects crude-oil production from this region to grow by between 1 and 1.4 million barrels per day by 2020, creating a number of exciting opportunities for midstream operators. I guess the message here is we remain pretty high on the Gulf of Mexico. A little bit about what’s driving that growth, it’s all about the deepwater. I think that’s people understand that now. It’s all about oil. It’s not about gas. But the second bullet point maybe is one of the more important ones. The quality of the oil that comes out of the Gulf of Mexico is the quality of the oil lot of the refiners here need. It’s not the light sweet crude that you see coming from the shale plays. It’s still the medium, medium heavy type of crudes. And we think we’re in pretty good position to capitalize on some of that, I’ll show you on the next map. Large inventory of discoveries, lot of appraisal going on, really getting geared up again after the Deepwater Horizon incident that takes couple of years kind of get back and step into Gulf. We think it’s getting there. Today, there’s 48 rigs drilling versus 44 pre-incident. And I think our view is, we expect 16 more to be coming into the deepwater Gulf by 2015. So we see a lot of activity, lot of opportunities. And again the projects will be, I’ll call them chunky. There will be big projects. And they won’t be coming on quickly. But we’re in the process of evaluating a number of them right now. And we’ve got, I think the competition out there isn’t what it used to be. So I think we got a good leg up to get some more of these projects under our belts. Genesis Energy LP (NYSE: GEL) is another MLP with exposure to this trend, though its units appear fully valued at the current quote.